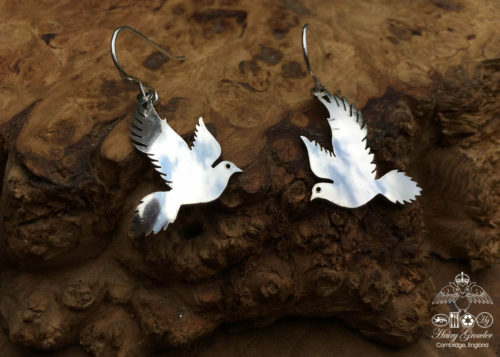 The Pennies from Heaven collection by Hairy Growler Jewellery, Cambridge, UK. 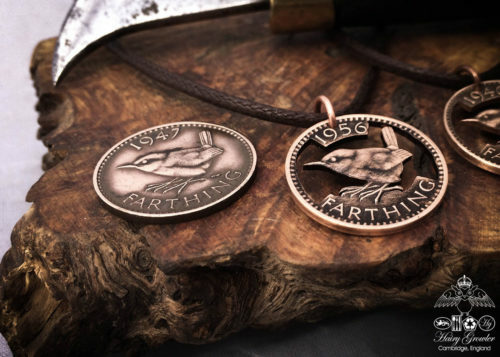 Original Golden Hind coin pendant jewellery created with true green, ethical principles and considerations. Looking for a particular year ? 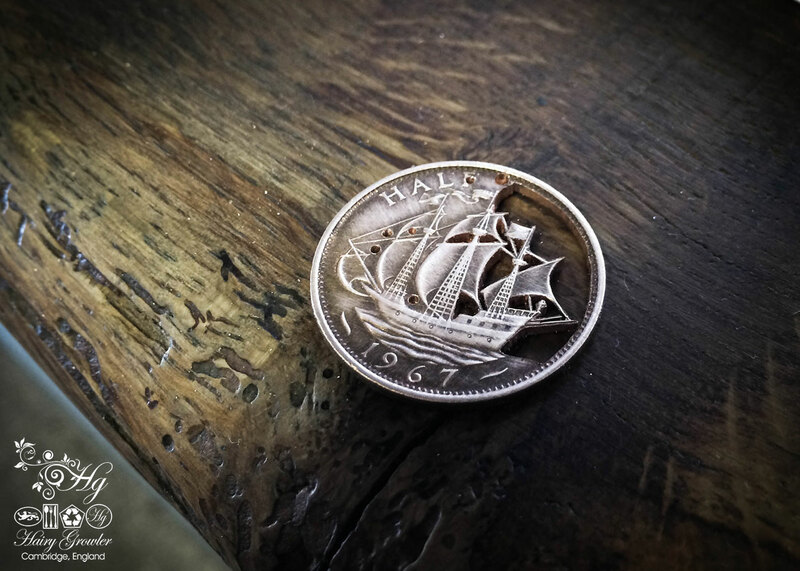 This coin, the old English half penny was issued with a lovely tall ship as the design inspired by Sir Francis Drake’s “Golden Hind”. 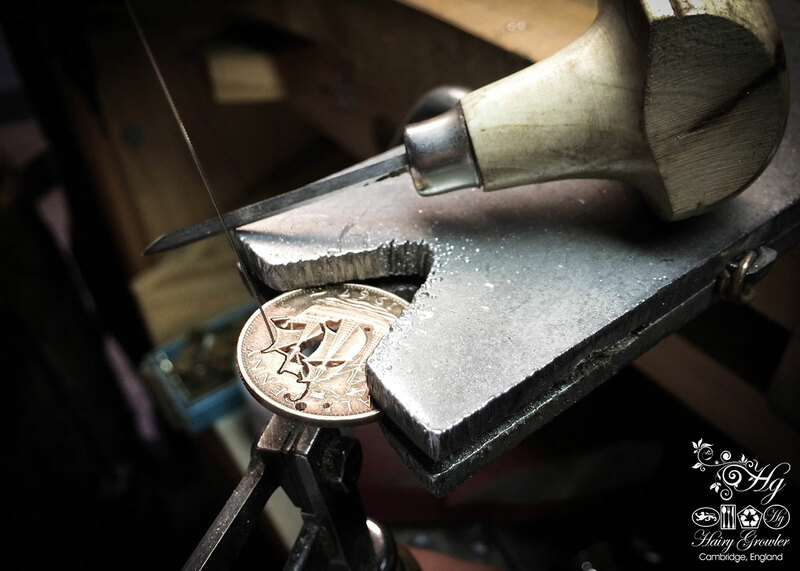 When this coin is hand pierced, filed and polished, the results are fabulous. 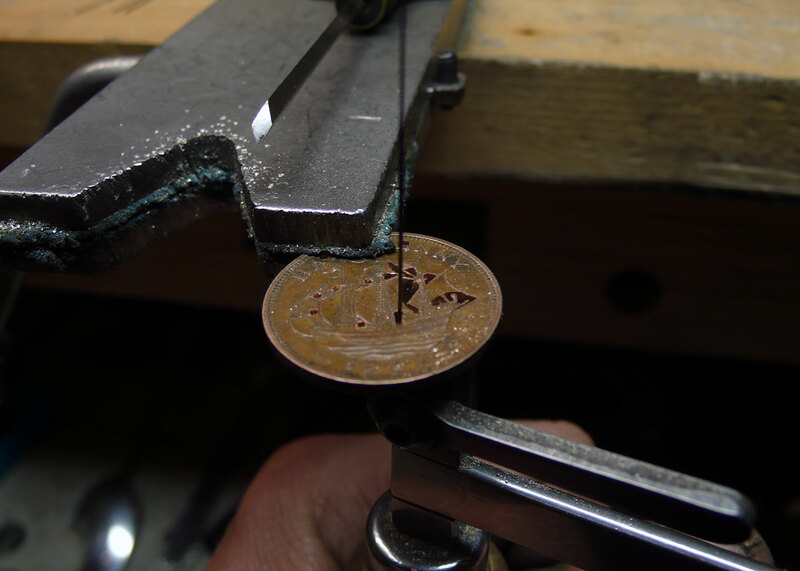 A great deal of time, absolute care and attention are required to create this ‘cut’ coin pendant. As you can imagine one tiny unwanted movement of the saw can easily (and does!) destroy a rigging line or mast on the ship, rendering all of the work up to that point completely useless. 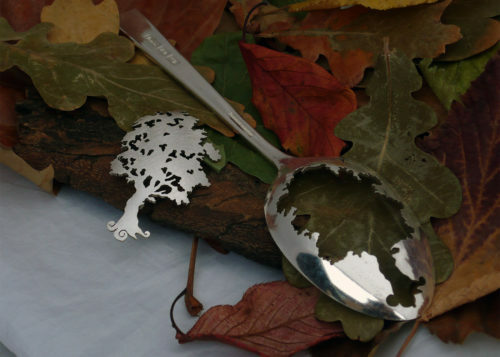 I have ordred this for my partner. You get to select the date that is perfect for you too. An anniversary or birthday year. Fabulous. Astonishingly light and cut out in amazingly intricate detail. This piece is far more than the photograph suggests and as an engineer I can appreciate the work that has gone into both making this and developing the skill to do so. My dad chose this himself for his anniversary gift from me. He loves the cut-out coins and picked a coin that was minted the same year he was born. 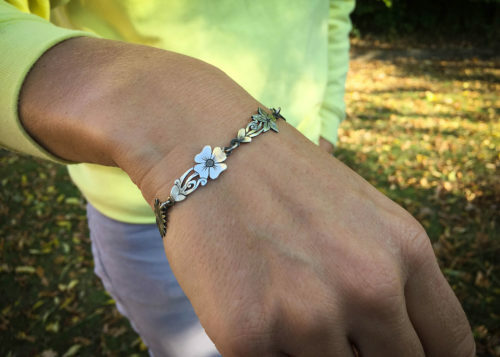 He isn’t a jewellery fan as such but he wears this most of the time and really appreciates the pieces made by Les. If you are reading this and have not ordered anything you would do very well to buy something, it is worth every penny! You my friend have a skill and a steady hand !!!!! Also I decided that the half crown being 32mm was too big as I didn’t want to be medallion man. So it sort of chose itself. 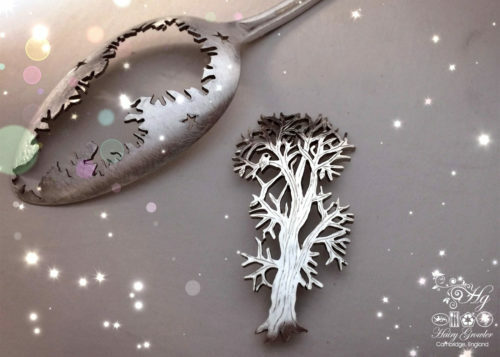 The coin pendant is amazing & is a credit to you . I had been looking at this on your website for a while and now finally I own one. 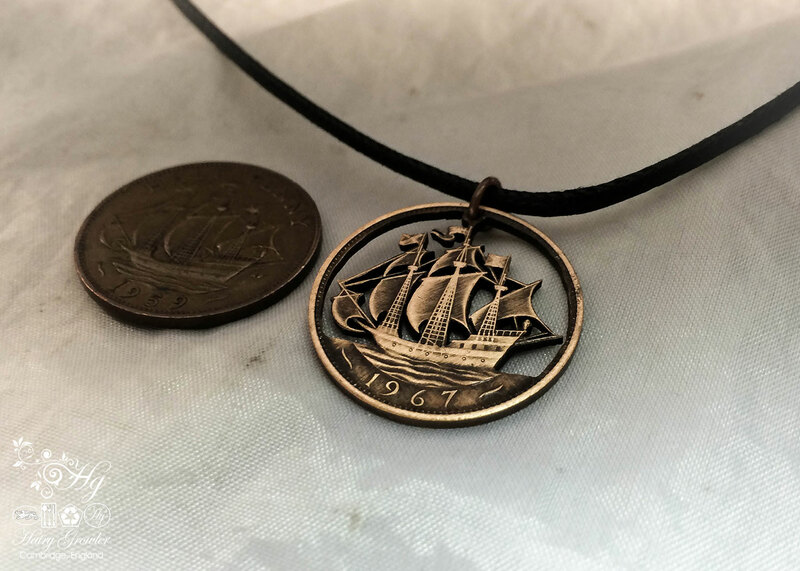 It is an exceptional piece of jewelry – the way the ship has been cut out is amazing and the coin is from my year of birth making it extra special. I am now the owner of another great piece of Hairy Growler jewelry. 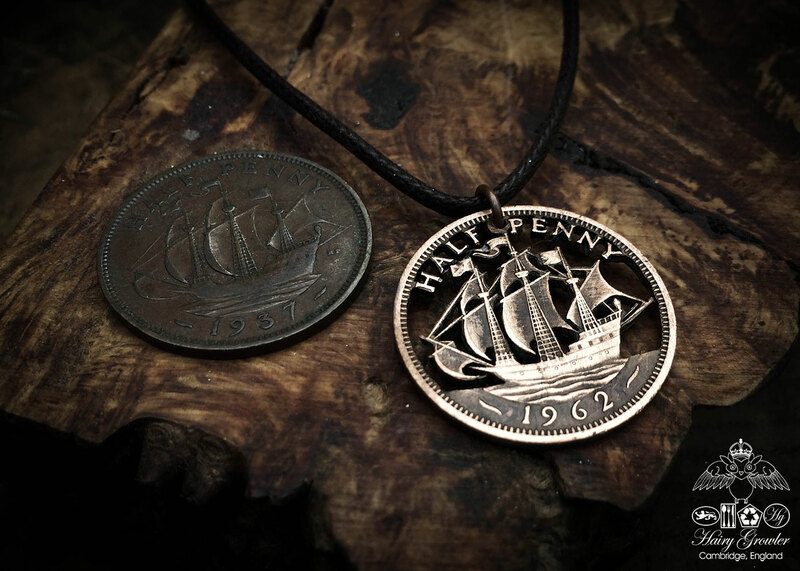 The Golden Hind pendant is lovely – the detail is amazing and the coin is dated with my birth year. I love it.